We get asked a lot of questions about our brewery. Everything from how big is your system to what hops do we use in our brews. Here you'll find answers to the questions asked most often. We've got an answer...most of the time. 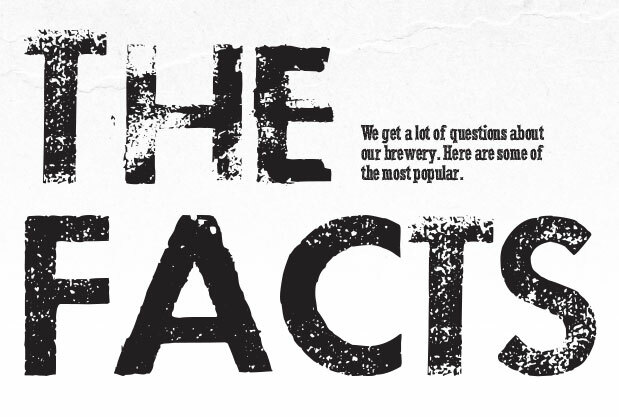 If after reviewing this section and the Tap Room FAQs page, you still have questions, please contact us. We'd love to keep you in the loop. We are excited that you are excited about our beer, and we want to answer as many questions as we can about our products. However, there are a few areas of our process that we don't share. Recipes, details about certain brews and a few other items fall into that category. We hope you understand that we want to keep making our craft brews to share with everyone and we have to protect our brewery, intellectual property and industry trade secrets to continue that mission. Q: When did you start brewing? A: Nantahala Brewing brewed it's first batch in April 2010. Q: What was your first batch? A: The popular Noon Day IPA was the first batch brewed on our production system. Q: How big is your brewhouse? A: We opened with a 10BBL Brewhouse back in 2010, but today we brew on a multi-vessel 20BBL system. Most brew days consist of brewing three batches in two shifts. Q: How long does it take to make a batch of beer? A: It depends on the beer. Most of our beers take between two and three weeks to produce. However, our high gravity brews such as the Devils Courthouse and the 8-Foot Drop Double IPA can take up to five weeks or more. Barrel-aged & sour beers can take years to produce. Q: Do you make ales or lagers? A: We make a wide range of craft brews including ales and lagers. Q: Where do you get your hops? A: The majority of all North American hops are grown in the Pacific Northwest. That area provides growers with the perfect conditions for growing hops in abundance. Q: Do you guys use local hops? A: On occasion we have used local Wet Hops to produce specialty single batch brews. There are many factors that currently prohibit the use of local hops in all of our brews including supply, quality and the lack of local drying and pelletizing equipment. Q: Where do you get your grain? A: Grain must be malted before it can be used to produce beer. Most of the malt houses have existed for hundreds of years -- primarily in Europe. These maltsters pass down their craft from generation to generation allowing them to make a consistant, high quality product used by brewers the world over. Like our peers, we purchase our grain from these malt houses through a handful of suppliers. There are a handful of craft malt houses that have popped up including Riverbend Malt in Asheville, NC. We source our malt from all of these sources. Q: Do you ever use local North Carolina grown grain? A: We have used some North Carolina grown grain provided to us by Riverbend Malt House, a young, locally owned malt house in Asheville, NC. A: Yes and No. We do not filter any of our hop-forward brews including the Noon Day IPA, ATX, 4-Foot Drop or 8-Foot Drop. We do filter a few of our beers including the Dirty Girl Blonde and Bryson City Brown. The rest are determined on a brew-by-brew basis depending on the affect filtering may have on the character of the beer. Q: On average, how much beer do you produce annually? A: Our first year we produced just over 400 BBLs. Since then we've increased our production to just over 4500 BBLs.